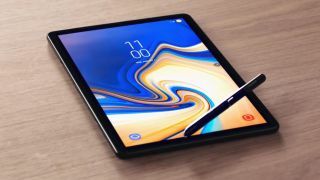 Samsung has launched their latest flagship tablet -- the Galaxy Tab S4 -- in India. As the name suggests, the 10.5-inch tablet succeeds the Galaxy Tab S3 and brings tons of new additions in terms of software features and hardware. It has a 10.5-inch 2560x1600p Super AMOLED display, Snapdagon 835 chipset with 4GB of RAM AND 64GB storage, which can be expanded using a microSD card of upto 512GB. There's a 13MP rear camera and 8MP front camera. It runs on Android 8.1 and it is powered by a 7,300mAh battery. You'll also get the S Pen stylus included in the box, a one-up on Apple which charges you extra for its Pencil. There are four, AKG-tuned speakers which support Dolby Atmos for a surround sound experience. The Tab S4 measures 249.3 x 164.3 x 7.1mm and weighs between 482g (for the Wi-Fi-only model) and 483g (for the Wi-Fi + LTE model). That makes it taller, thicker and heavier than the Galaxy Tab S3 (which has a smaller 9.7-inch display), and also thicker and heavier (but not as tall or wide) as the iPad Pro 10.5. Samsung says the tablet is made for "Supertasking", but note that the keyboard cover, POGO charging doc are not included in the box. You need to buy the accessories to help convert it into a hybrid machine. The company launched a separate Book Cover Keyboard, which is primarily a detachable keyboard and also doubled as a cover. It also provides support for Samsung Dex, allowing users to pair a traditional Bluetooth mouse and an Note 9 like expansive windows like experience using a USB to HDMI converter. There is a cost though, and the Book Cover Keyboard price is Rs 7499. However, as much as Samsung is highlighting the computing-like functionality of its new slate, it's an undeniable fact that the chipset onboard is dated. The Snapdragon 835 was launched at the end of 2016, and has since been largely replaced by the Snapdragon 845. It's a strange choice for a premium tablet, especially when it rivals the iPad Pro with A10X bionic chip. That said, paired with 4GB of RAM, the Android interface should still run well.